Google has added the Remote Desktop Feature to Google+ hangouts, using this new feature remotely connect and control your friend’s and family’s computer for tech support and other issues. Google+ hangout is the free video calling service provided by Google in their Google+ social network. Using Google+ hangout, make video call session with your loved ones from your computer and from mobile Google+ apps for Android and iPhone. The user limit is nine. You can have nine people in the single hangout session. Now Google has introduced the new Hangout Remote Desktop Feature to Google+. 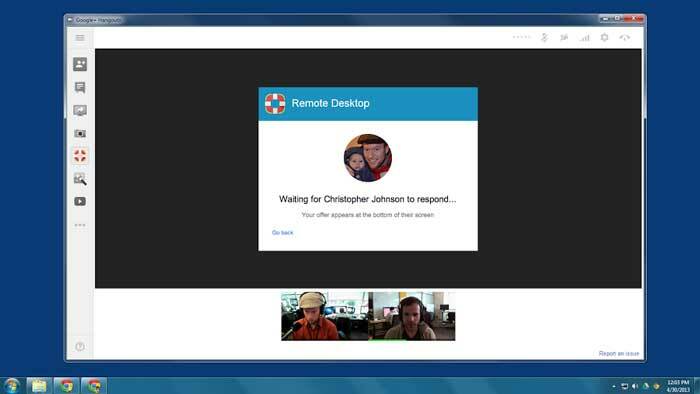 We have previously shared about the Chrome Remote desktop App for the Chrome browser that gives the same feature of this new Remote Desktop edition in Google+ hangouts. Obviously, Google also said that the Chrome Remote Desktop app functionality is the technology behind the Google+ hangout Remote Desktop feature. This could be a good alternative to remote access tools like Team viewer, LogMeIn,GoToMyPc and Skype share desktop. So, Google+ hangout Remote Desktop feature will potentially give more advantage to Google+ to get more users. Hangouts Remote Desktop lets you controlling their computer remotely with their permissions. Troubleshooting and making tech support to the computers of your friends and Family made easy with Hangouts Remote Desktop while you talking to them with Google+ Hangout session. To get Remote Desktop Feature in Google+ , just start a Hangout and click View More Apps > Add Apps > Hangouts Remote Desktop. If you are new to Google+ hangout, you have to install Hangout plugin in your computer to make hangout calls. Unlike other Remote Accessing tools, Google+ Hangout Remote Desktop is completely free, and you can make use of it to troubleshoot many computers in the Hangout session. It saves you the long telephone calls to tech support. Even any of your friend can easily control your PC to fix your problems. If you are Google Chrome user, checkout the Chrome Remote Desktop App to remotely control the computers bit faster and securely. Google has released 7.0 version of its web browser "Chrome".